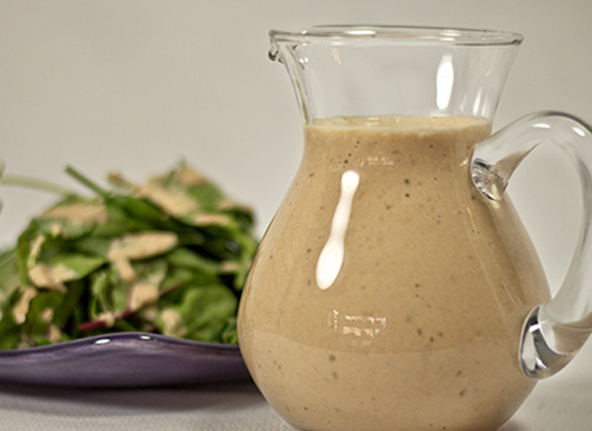 What’s nicer than being able to whip together a fresh batch of delicious creamy flavorful salad dressing in just seconds? This is especially a good recipe to have when you are transitioning to a whole foods diet since getting used to making everything from scratch takes a little more time than you might have. I’ll be the first one to admit that this isn’t the purest whole food salad dressing recipe I have to offer but it is not too far off and likely the quickest and even most delicious. 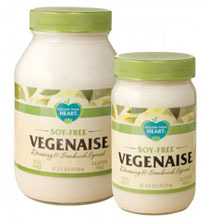 There are five different types of Vegenaise made with differing oils as the main ingredient. The started out using the Grapeseed one and my family immediately loved it. I have since switched to the Soy-Free Vegenaise. The Grapeseed Vegenaise is made with Expeller-Pressed Grapeseed Oil and the other is made with Expeller-Pressed High-Oleic Safflower Oil. Both oils are purported to have great health benefits (and better than the other three Vegeanaise options) but since neither are traditional oils that could be made in your own kitchen, I have to I recommend using them sparingly. Vegenaise is great to use mostly to transition off of the well known dangerous ingredients in bottled dressings and for convenience sake. If you are choosing between Vegenaise and standard mayonaise or miracle whip, hands down, go with the Vegenaise! I wish the Grapeseed Vegenaise didn’t have Soy Protein or Brown Rice Syrup for various unfavorable reasons but due to the small amounts we use, I am willing to make an exception in this case. The ingredients in Vegenaise are some of the cleanest, simplest, real food ingredients I have found in a store bought mayonnaise product. It contains 0 trans fats, no added chemical preservatives, is non-gmo, Vegan, gluten-free and dairy-free. Have you checked your favorite bottled dressing ingredients lately? If it’s better than Vegenaise, please let me know. It can be found only in the refrigerator section of health food stores and also in many grocery stores. Of course making your own mayonnaise is an option. I’ll share a recipe for that in the near future. 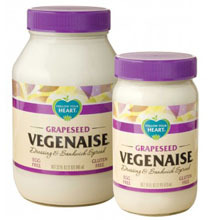 For now, however, I’m going to introduce you to Vegenaise. I think the Grapeseed Oil has a slight taste advantage over the Soy-Free but they taste similar. For more info on Vegenaise visit their website. Expeller-Pressed Grapeseed Oil, Filtered Water, Brown Rice Syrup, Apple Cider Vinegar, Soy Protein, Sea Salt, Mustard Flour, Lemon Juice Concentrate. Expeller-Pressed High-Oleic Safflower Oil, Filtered Water, Brown Rice Syrup, Apple Cider Vinegar, Pea Protein, Sea Salt, Mustard Flour, Lemon Juice Concentrate. The second ingredient is salsa. Look for freshly made salsa in the refrigerator section of your local grocery or health store. Choose one that is free of chemical preservatives. If you can’t find one that is, than it would be worth it to make your own. See Salsa Recipe here. Another recipe using Vegenaise in is Everyone’s Favorite Ranch Dressing. This dressing is essential in replacing the crappy ingredients in bottled ranch dressing. You’ve got to admit, kids love their veggies with ranch dressing. Stir the two ingredients together by hand with a spoon or if you don’t like the chunks, blend together in a blender. Kids may find blending it more appealing. Taste the dressing to see if it is to your liking. Add more salsa or Vegenaise to adjust if needed. The amounts can vary dramatically which is why I never measure the ingredients. Keep in a jar with a lid in the refrigerator for a week or so. This dressing is also great poured over steamed vegetables.